This article was submitted by Elizabeth Bailey, Program Coordinator for the Somenos Marsh Wildlife Society. Elizabeth attended the 2014 Wetlands Institute. The new wetland will filter stormwater and provide habitat. Along with a team of experts and community supporters, the Somenos Marsh Wildlife Society (SMWS) has restored a wetland pond in the Somenos Marsh to treat storm water and create wildlife habitat. It has been a journey to get to this point but this pilot project has been a long-time goal for SMWS. After months of planning and gaining approvals the pond was finally dug on March 19th. Beverly St., in Duncan BC, was abuzz with activity as woody debris for the wetland was delivered on big trucks and the excavator operator got to work. This project, funded by Environment Canada’s National Wetland Conservation Fund and the Municipality of North Cowichan, was undertaken for two purposes. The first is to treat storm water coming off the nearby urban area and draining into the marsh. This runoff contains road pollutants that can degrade downstream fish habitat. Wetlands increase the residence time of water on the land allowing time for plants and soil biota to bio-remediate some of the toxins. The second purpose is to create wildlife habitat by adding open water, wood features and native vegetation. We have lost a great deal of wetland habitat on southeastern Vancouver Island due to land use change. By restoring wetlands we hope to improve the situation for the many species that depend on them. The Somenos Marsh, being so close to the city of Duncan, has the advantage of being quite accessible to the public. 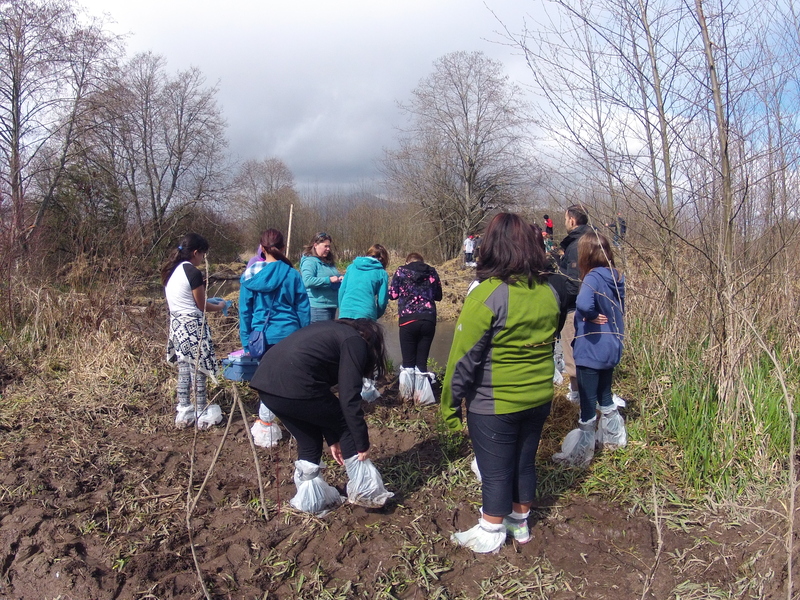 The new wetland has already been used as an open-air classroom as students from Alexander Elementary School came out in its first few weeks of existence to help plant and learn about water quality and invertebrates. The Somenos Marsh Wildlife Society hopes to continue this work in partnership with North Cowichan and eventually treat all the storm water entering the Somenos Marsh Conservation Area before it reaches Coho-bearing Somenos Lake and Creek.